This week we look at the second half of the infringement analysis. Well, it’s half if you consider it as one of two elements. However, if we look at how much work or effort you have to put into this, it’s much more than half. As a brief review, last week’s class set forth the two elements a plaintiff had to prove (beyond owning a valid copyright): 1) copying and 2) improper appropriation. Copying basically means that the defendant actually copied form the plaintiff’s protected work in stead of, say, coming up with the similar work completely independently or copying from a third work from which the plaintiff also copied. Improper appropriation asks whether what the defendant copied was substantially similar to that part of the plaintiff’s work protected by copyright. Is the allegedly infringing work substantially similar to the copyright protected elements of the plaintiff’s work? The test for infringement of a copyright is of necessity vague. In the case of verbal “works” it is well settled that although the “proprietor‘s monopoly extends beyond an exact reproduction of the words, there can be no copyright in the “ideas” disclosed but only in their “expression.” Obviously, no principle can be stated as to when an imitator has gone beyond copying the “idea,” and has borrowed its “expression.” Decisions must therefore inevitably be ad hoc. In the case of designs, which are addressed to the aesthetic sensibilities of an observer, the test is, if possible, even more intangible. 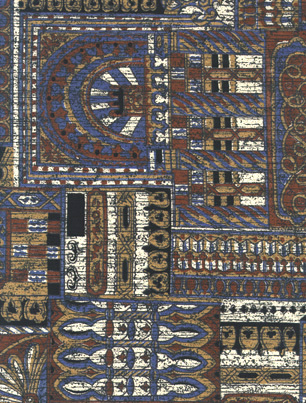 No one disputes that the copyright extends beyond a photographic reproduction of the design, but one cannot say how far an imitator must depart from an undeviating reproduction to escape infringement. Essentially, copyright infringement would be a lot clearer if we said only exact reproductions were infringing. That would make it much easier to predict the outcomes of cases. But we wouldn’t think it was particularly fair if someone could just make a few minor changes and get away with copying the rest? And that wouldn’t really effectuate the goal of providing economic incentives to creators. So, copyright says that a n infringing work does not have to be an exact copy – it only has to be substantially similar. That’s one source of murkiness in the test. On the other side, we also say that copyright cannot protect ideas; instead, it only protects expressions. So someone can copy ideas without being infringing. But the line between what is an idea and what is expression is itself nearly impossible to nail down. These two facets, Judge Hand was saying, create the vagueness and uncertainty that surround the infringement test. Take for example two cases that take two completely different approaches: Roth Greeting Cards v. United Card and Satava v. Lowry. Roth involved two greeting card makers. Roth claimed that United had copied a number of its cards. The short statements on the front and inside of the cards were virtually the same, as was their general placement. The art work was different (generally a cartoonish character under the words on the front of the card). In addressing the improper appropriation element, the court did not try to make a detailed determination of what was protected as expression and what was idea. Note that the words themselves were just phrases or sentences that were too short by themselves to receive copyright protection. 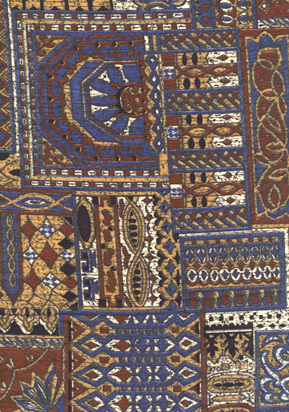 It was the selection and arrangement that yielded the originality sufficient for copyright protection. It appears to us that in total concept and feel the cards of United are the same as the copyrighted cards of Roth. With the possible exception of one United card (exhibit 6), the characters depicted in the art work, the mood they portrayed, the combination of art work conveying a particular mood with a particular message, and the arrangement of the words on the greeting card are substantially the same as in Roth‘s cards. In several instances the lettering is also very similar. The remarkable similarity between the Roth and United cards in issue (with the possible exception of exhibits 5 and 6) is apparent to even a casual observer. For example, one Roth card (exhibit 9) has, on its front, a colored drawing of a cute moppet suppressing a smile and, on the in- side, the words “i wuv you.” With the exception of minor variations in color and style, defendant‘s card (exhibit 10) is identical. Likewise, Roth‘s card entitled “I miss you already,” depicts a forlorn boy sitting on a curb weeping, with an inside message reading “… and You Haven‘t even Left …” (exhibit 7), is closely paralleled by United‘s card with the same caption, showing a forlorn and weeping man, and with the identical inside message (exhibit 8). In contrast to the overall impression approach taken by the court in Roth, the court in Satava v. Lowry took a very detailed-oriented approach to the evaluation under the improper appropriation element. Satava involved two sculptors who made glass sculptures that resemble jellyfish – brightly colored glass inside a cylinder of clear glass. Here the court took great pains to determine what was merely an idea first and then excluded any similarities of ideas from the substantial similarity analysis. The originality requirement mandates that objective “facts” and ideas are not copyrightable. Similarly, expressions that are standard, stock, or common to a particular subject matter or medium are not protectable under copyright law. It follows from these principles that no copyright protection may be afforded to the idea of producing a glass-in-glass jellyfish sculpture or to elements of expression that naturally follow from the idea of such a sculpture. 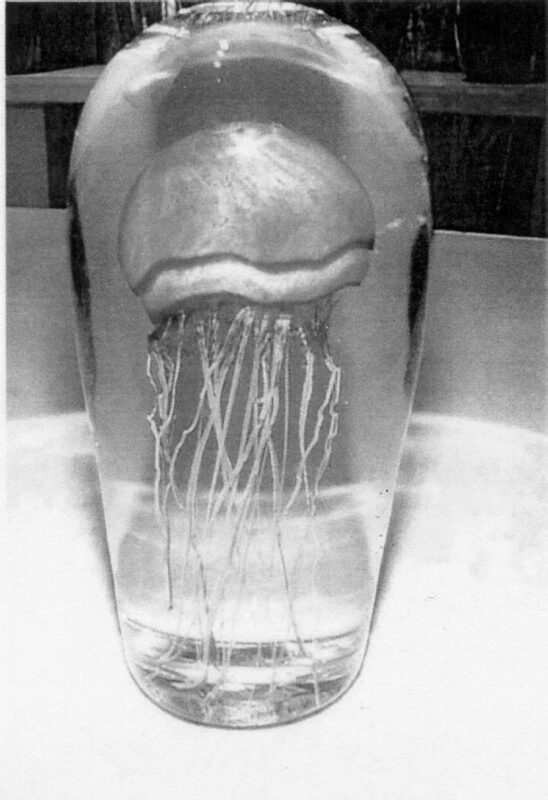 Satava may not prevent others from copying aspects of his sculptures resulting from either jellyfish physiology or from their depiction in the glass-in-glass medium. Satava may not prevent others from depicting jellyfish with tendril-like tentacles or rounded bells, because many jellyfish possess those body parts. He may not prevent others from depicting jellyfish in bright colors, because many jellyfish are brightly colored. He may not prevent others from depicting jellyfish swimming vertically, because jellyfish swim vertically in nature and often are depicted swimming vertically. Satava may not prevent others from depicting jellyfish within a clear outer layer of glass, because clear glass is the most appropriate setting for an aquatic animal. 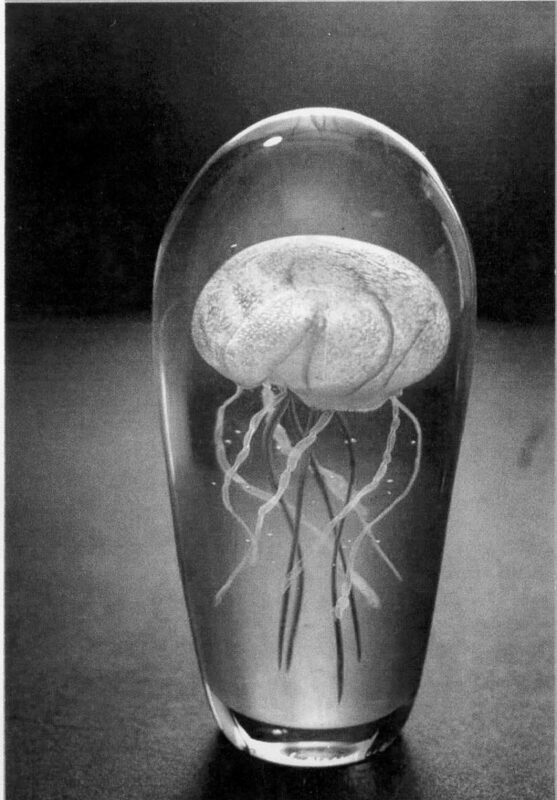 He may not prevent others from depicting jellyfish “almost filling the entire volume” of the outer glass shroud, because such proportion is standard in glass-in-glass sculpture. And he may not pre- vent others from tapering the shape of their shrouds, because that shape is standard in glass-in-glass sculpture. Satava‘s glass-in-glass jellyfish sculptures, though beautiful, combine several unprotectable ideas and standard elements. These elements are part of the public domain. They are the common property of all, and Satava may not use copyright law to seize them for his exclusive use. It is true, of course, that a combination of unprotectable elements may qualify for copyright protection. But it is not true that any combination of unprotectable elements automatically qualifies for copyright protection. Our case law suggests, and we hold today, that a combination of unprotectable elements is eligible for copyright protection only if those elements are numerous enough and their selection and arrangement original enough that their combination constitutes an original work of authorship. The combination of unprotectable elements in Satava‘s sculpture falls short of this standard. The selection of the clear glass, oblong shroud, bright colors, proportion, vertical orientation, and stereotyped jellyfish form, considered together, lacks the quantum of originality needed to merit copyright protection. These elements are so common- place in glass-in-glass sculpture and so typical of jellyfish physiology that to recognize copyright protection in their combination effectively would give Satava a monopoly on lifelike glass-in-glass sculptures of single jellyfish with vertical tentacles. Because the quantum of originality Satava added in combining these standard and stereotyped elements must be considered “trivial” under our case law, Satava cannot prevent other artists from combining them. Note that the court did not say that Satava had no copyright in his sculptures; rather, the court said he did not have copyright protection in that which Lowry copied. We do not mean to suggest that Satava has added nothing copyrightable to his jellyfish sculptures. He has made some copyrightable contributions: the distinctive curls of particular tendrils; the arrangement of certain hues; the unique shape of jellyfishes‘ bells. To the extent that these and other artistic choices were not governed by jellyfish physiology or the glass-in-glass medium, they are original elements that Satava theoretically may protect through copyright law. Satava‘s copyright on these original elements (or their combination) is “thin,” however, comprising no more than his original contribution to ideas already in the public domain. Stated another way, Satava may prevent others from copying the original features he contributed, but he may not prevent others from copying elements of expression that nature displays for all observers, or that the glass-in-glass medium suggests to all sculptors. Satava possesses a thin copyright that protects against only virtually identical copying. What is of note is that both cases would have come out differently had they used the approach taken by the other. If the Roth court had taken a detail-oriented approach and eliminated all those aspects of the selection and arrangement that are common to most all greeting cards, what might be called functionality-driven ideas, then there would have been nothing left under copyright protection that was copied by United Cards. Conversely, if the Satava court had merely asked whether the two sculptors works shared the same total concept and feel, the court would have concluded that they did. What is protected expression and not unprotected idea? Is there substantially similarity between the allegedly infringing work and the expression of the copyrighted work? We talked about the idea/expression dichotomy way back in class 3 when we talked about the Nichols case. We can look at it from two directions. If we take recognized expression, let’s say a novel. Then we start to create greater and greater levels of abstractions from that expression. At some point of abstraction, it will become idea not expression. Taken from the other direction, we can take an idea and start adding more and more details. At some point it will become expression. Of course, where that line is, no one knows. The quoted portions of the Satava case above are an example of a court looking at the idea/expression dichotomy. You’ll note that we ran into the term “substantial similarity” last week when we were talking about the copying element. One of the most common ways to prove copying was to do so by inference: showing the defendant had access to the copyright protected work and showing that the allegedly infringing work was substantially similar. From those circumstances, a judge or jury could conclude that copying had occurred. We see the same words in the improper appropriation analysis, but the test is different. This is one of the frequent sources of confusion. In the copying analysis, we look to dissect the two works as experts would and then ask how similar they are, and we are not concerned about which parts of the copyright protected work are actually protected by copyright. In contrast, under the improper appropriation analysis, we ask whether certain parts of the two works would be considered substantially similar to an ordinary observer. In Arnstein v. Porter, the court said that the ordinary observer was a lay person. Basically, your average person off the street. However, that was refined, or perhaps clarified, in Dawson v. Hinshaw. As a part of the improper appropriation test, the court said that the ordinary observer should be one who was the intended audience of the work. The court explained how this was what Arnstein case actually stood for, despite its use of the “lay person” language, and how this best served the incentive theory underlying copyright. Arnstein v. Porter provides the source of modern theory regarding the ordinary observer test. Arnstein involved the alleged infringement of a popular musical composition. Writing for the panel, Judge Jerome Frank first explained that “the plaintiff‘s legally protected interest is not, as such, his reputation as a musician but his interest in the potential financial returns from his compositions which derive from the lay public‘s approbation.” This initial observation gave force to the recognized purpose of the copyright laws of providing creators with a financial incentive to create for the ultimate benefit of the public. Consistent with its economic incentive view of copyright law, the Arnstein court concluded that “the question, therefore, is whether defendant took from plaintiff‘s works so much of what is pleasing to the ears of lay listeners, who comprise the audience for whom such popular music is composed, that defendant wrongfully appropriated something which belongs to plaintiff.” Thus, under Arnstein, a court should look to the reaction of “lay listeners,” because they comprise the audience of the plaintiff‘s work. The lay listener‘s reaction is relevant because it gauges the effect of the defendant‘s work on the plaintiff‘s market. Although Arnstein established a sound foundation for the appeal to audience reaction, its reference to “lay listeners” may have fostered the development of a rule that has come to be stated too broadly. Under the facts before it, with a popular composition at issue, the Arnstein court appropriately perceived “lay listeners” and the works‘ “audience” to be the same. However, under Arnstein‘s sound logic, the lay listeners are relevant only because they comprise the relevant audience. Although Arnstein does not address the question directly, we read the case‘s logic to require that where the intended audience is significantly more specialized than the pool of lay listeners, the reaction of the intended audience would be the relevant inquiry. In light of the copyright law‘s purpose of protecting a creator‘s market, we think it sensible to embrace Arnstein‘s command that the ultimate comparison of the works at issue be oriented towards the works‘ intended audience. …and that does not even start to take into account when you enter areas like computer software. Read on if you dare – Computer Associates v. Altai. Please Sir, please delve into the issue of how much copyright is a full copyright. My understanding is I own the copyright on anything I write the minute I start writing. I am given to believe registering my copyright with the United States Copyright Office gives me more rights to my intellectual property but is not absolutely necessary. I have, for example, a memo from Penguin books saying ‘no need to copyright your novel before you send it to us. If we like your work, we’ll get the copyright for you.’ (or words to that effect). Care to comment? Yes, in the US, copyright subsists in any original work of authorship fixed in a tangible medium of expression. So once you have original (low hurdle), a work (low hurdle) and fixation (pretty much anything), you have copyright (as long as you are not writing as an employee within the scope of your employment (if so, see work for hire in a previous class). Registering gives you lots of advantages, if done in a timely fashion. I strongly suspect what the Penguin books person was talking about was registration when they said “we’ll get the copyright for you.” That is typical industry practice.